We got up, turned right when we got out from the hotel, kept walking on East Broadway and then we turned left before Seward Park and walked straight until we reached Lower East Side and turned left on Broome Street. 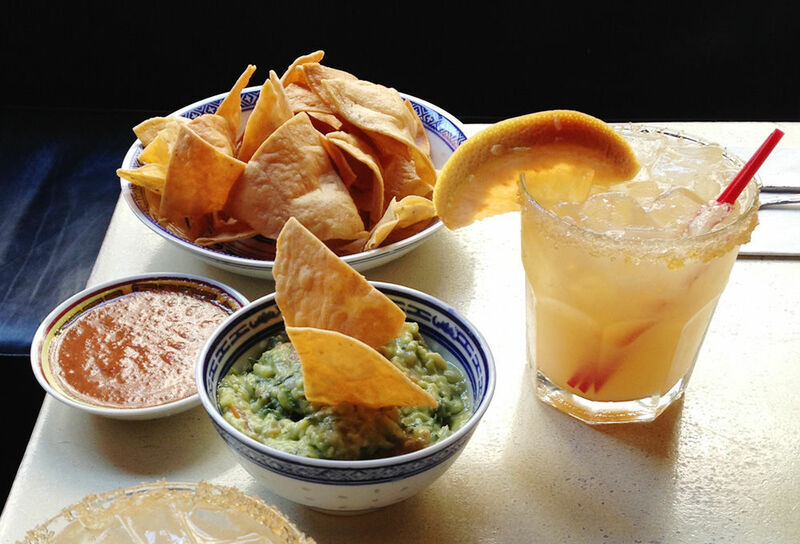 There's a Mexican place on Broome Street that's supposed to be good and it was. I like guacamole made just by using avocados, lime, salt and garlic. But for a change I like to mix in chopped onions, tomatoes and coriander. This place had the perfect mix and the juiciest avocados that can be found. I've previously not taken much notice in the varieties of avocados, I just like them. But recently I've found out that I like the green thin skinned longer avocados even more as they are juicier and has a more grassy fresh flavour, they are called fuerte. The darker more chubby ones are more nutty in their flavour and are called hass. At this Mexican place we went to I'm pretty sure they used fuerte for their guacamole. Add a smooth and spicy salsa with some freshly prepared tortilla chips and not forgetting salt on the edge of the margarita glass and there's not much more to ask for. I even had one of the best skirt steaks maybe ever, with rich charcoal grilled flavours found underneath two sunny side fried eggs and black beans on the side. Funnily enough the glass of water was also one of the better ones I've had, in the hotel I nearly puked every time I brushed my teeth. The New York water normally tastes like the smell of Milano's Bar's washed floor. Nothing beats water that doesn't smell, it makes you happy for real. We walked west and first I saw a whole stack of wooden boxes with coriander, then I saw a store selling avocados only. This is a good city. I went into a shoe store and when I started to look at a pair of Converse that I actually could think of wearing the salesperson asked me where I was from. I said Sweden. American salespeople always want to be friends with you, trying so hard to sell you something. He was a fun guy though. He started talking about Swedish House Mafia, "how come they quit playing", he asked. "They weren't good enough", I told him. "Ha, not good enough!" he laughed back. "We only have three pairs left." "Thanks, maybe next time", I said and then we left. I got into another shoe store, on Broadway, I found shoes called Kramerr [sic] and I bought them. Front Street is located in South Street Seaport on southern Manhattan and it's really nice to walk around in the area. 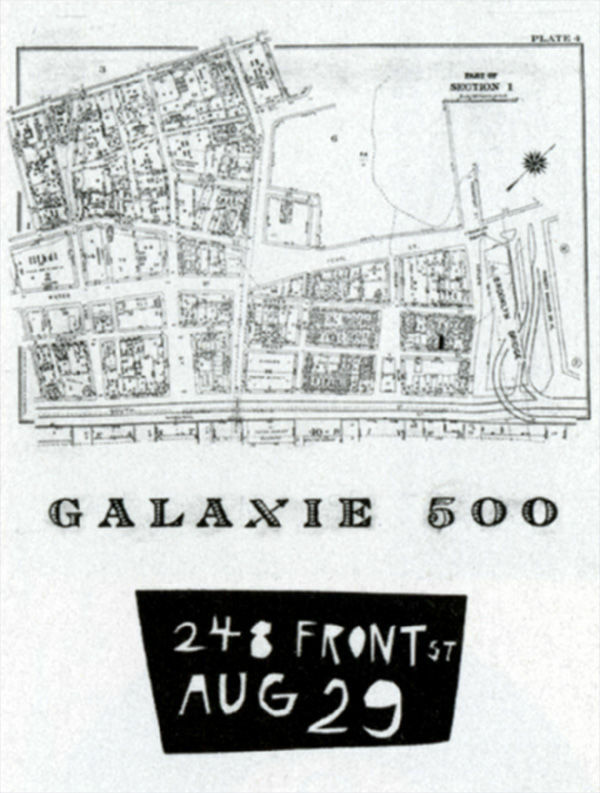 The poster for the Galaxie 500 concert 1987 in Dean's apartment has a map of the area on it that Naomi Yang found in a book her architect parents had. The streets are very peaceful and many of the building are old and really beautiful. I doubt it was considered peaceful and beautiful several hundred years ago when it was one of the busiest seaports in New York. Or even when Dean lived in his apartment in the 80's. I think I asked Dean about it all but it was late at night and unfortunately my memory fails me. A couple were making out right in front of 248 Front Street, when we started taking pictures they went away. We continued our walk and walked under Brooklyn Bridge instead of the more common way to do it, to walk on it, but under is good too. Again we went early to the show. At the bar downstairs before they opened the stage doors we met Patrick, he had been to the concert the day before too. We started to talk about our appreciation of the band and he seemed honestly glad to hear what I had to say, we where definitely on the same level. He doesn't listen to much Dylan from after the motorcycle incident in 1966 he said, something I do. We talked more about Luna and whats so great about them. Patrick seemed to agree especially when I said that the band never has any pre written stage talk that's being repeated night after night. That's one of the things that makes it feels like every show is unique. I like the chemistry on stage. And we talked about the sound. The unique voice Dean has, I like that, when no one ever could sound like Dean even if they tried. The friendly and funny staff downstairs played good music too. Something that I thought was Moon Duo was in fact Wooden Shjips, I like both bands. We waited patiently for them to open up doors. The band had new t-shirts to sell, we could see them in the entrance. The days before the flight we tried out Ulrika's more than 10 years old Luna t-shirts, almost none of them fitted us. I wore a Dylan t-shirt instead, something I almost never do, I prefer my shirts but I felt really relaxed and comfortable. I was ready to move. And then they opened up and we moved right in, standing in the front left. By the stage we met Giselle that I'd taken pictures of the day before because she looked so dedicated. She's British-Canadian-American and knows more about many small Swedish acts than I do. She was a fan of Those Dancing Days that now has hived off into Volkano, a band I don't even think I've heard yet. She asked what Swedish bands we like, a could hardly come up with any at that moment. Paper is good. There's hundreds of other bands we like but most have moved on. People that go to several shows no matter what band usually have a wide span of music they like. We talked about that the sound, expression and emotions are more important than the words. Patrick bought us a drink. 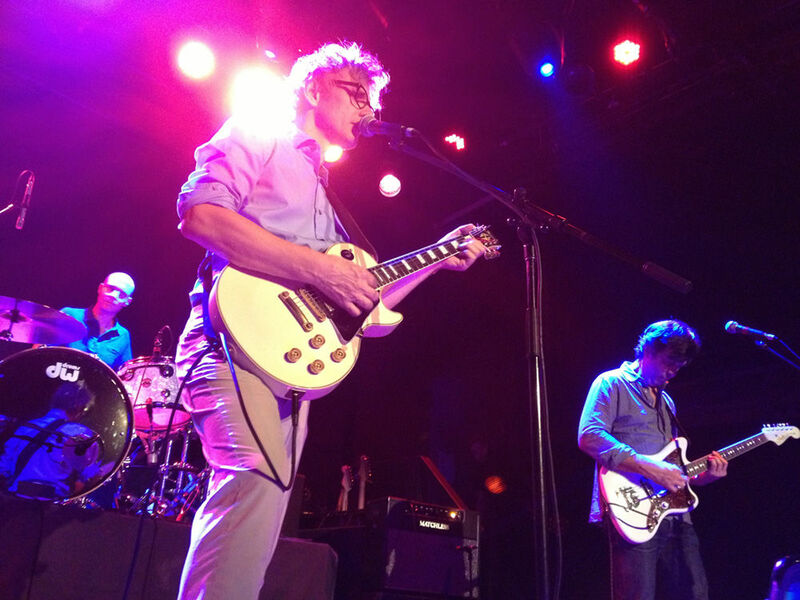 It's nice being at Luna shows, before, during and even after. The place filled up more quickly than the day before. It felt like this was going to be different. I felt good. Dean & Britta walked around on the stage floor before the show and that reminded me to hand him over some records with Swedish translations of two of their songs. In fact Ulrika reminded me and she had already met him and told him that I was going to give a small plastic bag. A few years back Håkan Hellström translated I Want Everything to Jag Vill Ha Allting. Håkan is huge in Sweden, all of his albums go to number 1 and he just sold out two 70.000 capacity arena gigs in minutes. Låtsaspoeten (The Pretend Poet) is a small one man band and has recently turned Lovedust into Kärleksdamm. I particularly like this cover, it's so unpretentious and heartfelt, warm and simple yet perfectly played since he works professionally with recording other bands. Normally I like covers that are radically different from the original and while this is an almost straight cover it still is so different because of his very friendly southern Swedish accent that is making the song quite different. I think it's one of the best songs of the year. I handed Dean the two cd's and even some text translated to English about these bands. And I wished him good luck and then went back to my spot. 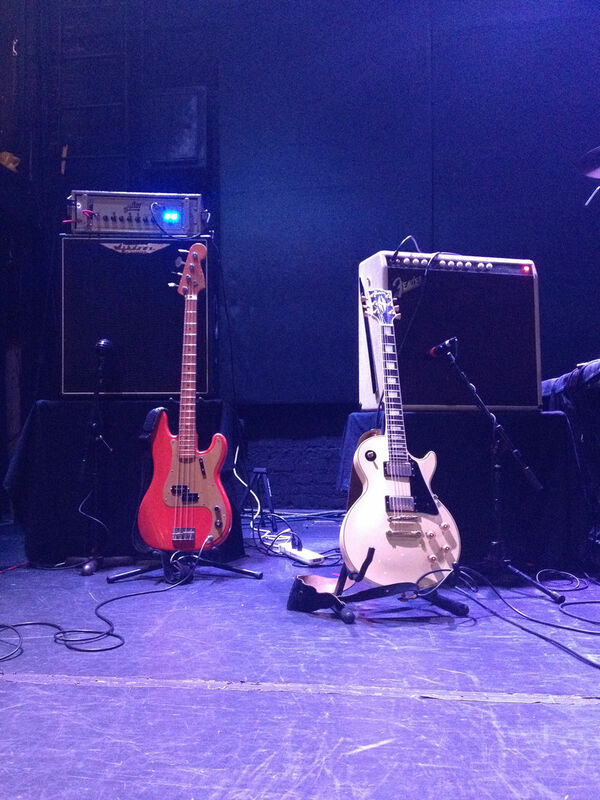 The white guitar was back in the stand next to Britta's red bass. And when they came on the sound was better than the previous day, with a much more distinct and rich sound. Slide is such a great opener. It must be fun to play it too, especially for Britta, the bass melody lines are just perfect, smooth as silk, it feels good all along the spine to hear it and to see them play it. The tempo of the concert was higher and it was more intense too. Speedbumps came on next, a song if it wasn't as poppy almost sounds like an old post punk song, it could have been written and sung by Joy Division, The Sound or even The Sisters of Mercy. "We where brown and we where down." Rhymes made in haste in the studio perhaps, I don't know, but it sounds great. I love the line "It's raining rain, it's raining snow." It's exactly what will happen soon over here in Stockholm, the weather is gonna be awful for months. Streets filled with slush. And New York is probably the same. I like "tell me who I'm supposed to be" too as it is what I want to know. Tracy I Love You is maybe Luna's most beautiful song ever and shows off even better Luna's original lyric poetry and in this one it almost sounds like Dylan's She Belongs To Me. "Tell me stories on my birthday, buy me gifts on Halloween" is Dean's twisted "For Halloween buy her a trumpet, and for Christmas buy her a drum". Every song was just perfect, this night was downright perfect. Malibu Love Nest was interesting to hear the day before with the different guitar sound, and now it was back to normal and it always makes very happy, in any incarnation and especially when it's this good. They played Double Feature the day before and now they played Kalamazoo and I had to put the camera on rec. Dean uses his metal slide and gets a twangy sound. They felt a bit unsure playing it but it was very nice to hear something we hadn't heard previously. It's a wonderful song and I'm so glad they played it since we were hoping for a couple of tracks that we'd not heard before from the Penthouse album. This was a good night. They continued with Tiger Lily and before the song Dean said out there where two Bob Dylan fans in the audience on each side of him pointing with his hands to us and another person a bit further away. It's hardly one of our favourite songs, it honestly works better on the album but it's always one of the most anticipated songs by the audience and gets big cheers. I wish it could be a little less soft, I would like to see them play it when they're angry, and Lee had left his brushes in the tour van. Friendly Advice is one the three center pieces at their shows and always get the steam up. I can't get enough of it. Dean's having a sip of his Stella beer, dressed in bright trousers and blue shirt. They are making jokes between songs like always. The crowd sings along. "How… long… can this go, how… long… can this go ON." Dean is taking a step back and plays around on the solo, fools around and is looking concentrated and nodding his head. The audience claps in the break and Dean doodles notes just like he can while Sean is taking care of the fast rhythm up high on the fretboard. 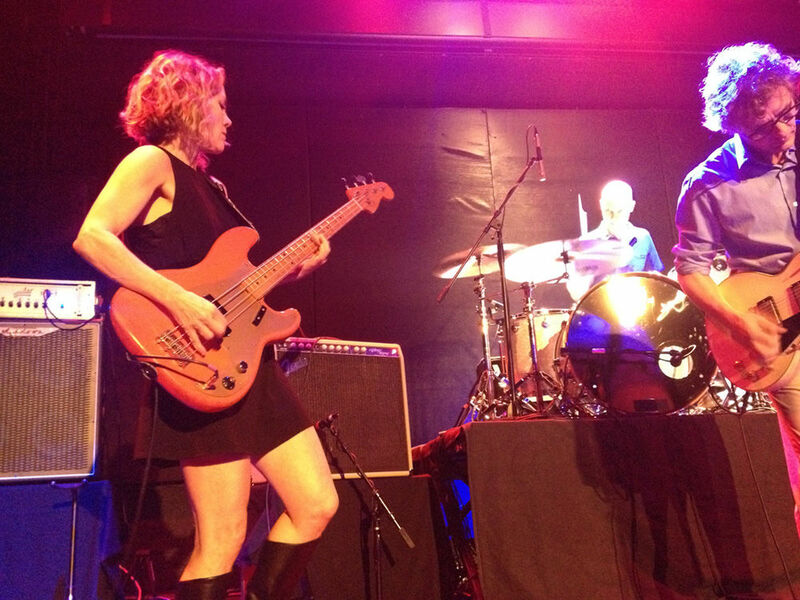 Britta keeps it all melodically heavy and steady and Lee is hitting the cymbals harder and harder, almost standing up at the end, the sound grows and grows and the audience screams. In Bewitched the audience sing along as well. People ask for Hedgehog and Sean says that they rehearsed it the day before. But then they decided not to play it. "I even bought a special pedal for it. Why did I buy the pedal?" Sean says. And they start to play another Penthouse song we've not heard live before, Freakin' and Peakin'. If you haven't noticed, I love those songs that starts out as a regular song and then builds up more and more, ending with two chords back and forth more and more intense. Some people might say it goes on without direction, but I like those. This is another. And then there is Slash Your Tires with Dean's most melodic guitar line, timeless and impossible not love. Maybe it's borrowed, but I can't come up with from what song that would be. They're supposed to be the best songs, when they remind of something else but you don't know what song. It's another dance and hand clapping song, 23 Minutes in Brussels and a great show becomes even greater. Sean excels with his sweet tones and Dean messes it up, in a very very good way. Season of the Witch is the encore, and they play Indian Summer better than ever, after the songs Dean steps forward and say something directly into the camera that is still on the stage floor and records. It looks like he says with a smile on his face, "don't put this on YouTube". I promise I won't. The show is over and we head down to the bar and meet Greg and Alan that we met in Spain in April. They want to buy us a beer. And there are two nice Spanish girls that we start talking to. I can't seem to remember her name I'm afraid, which bugs me, but one of them is a big Luna fan and tells me that she read my text about the UK tour, it makes me happy. Her friend heard Luna for the second time, the first was the day before. I ask her about the show, and she says it was much better than yesterday, the songs are easier to like and the energy is more intense. Britta and Ashley, Sean's girlfriend, come down and tell us where there will be an after party and they want us to come. Me, Ulrika and the Spanish Luna fan girl shares a cab with Lee to Beauty Bar on 14th Street. It's a place decorated as a 1950s hair salon. When we arrived Dean handed me and Ulrika drinks tickets. 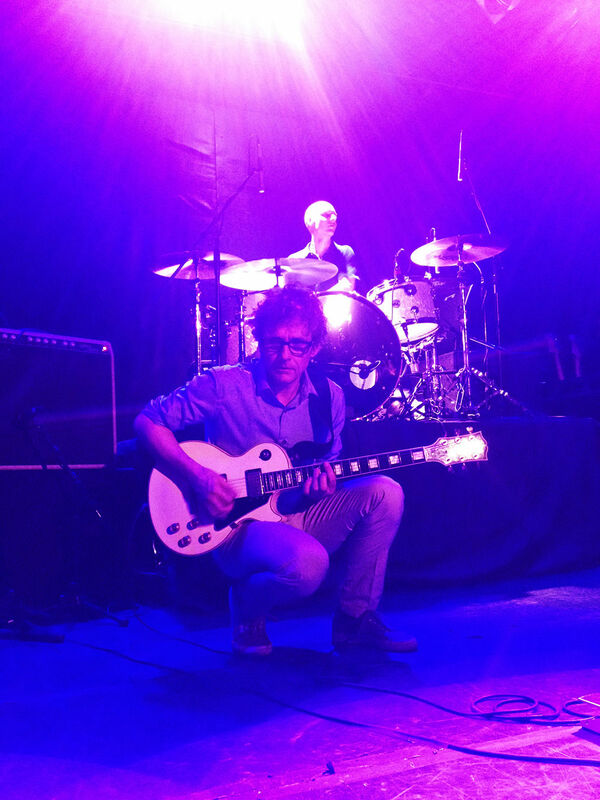 We had a great time, talking to Lee about his songwriting contribution to the band among other things, Dean about why he chose to use the green guitar on the first night. He said he wanted to do something different. And we probably talked to many others. Alan of course, I got of a funny picture of him with his head in a 50s dryer hood. After an hour or something Britta comes over and wants us to join her on the dance floor further into the room. I wouldn't say no to that invitation. I danced with Britta Phillips. I felt a bit weird that she was wearing a beautiful dress and I only had my t-shirt and totally worn out jacket. I asked why Dean didn't seem to want to dance. "He only dances to New Order", Britta replied. Ulrika is the same. Well, she dances to The Cure and Roy Orbison too, and obviously to Luna. The two were standing in opposite corners in the small room moving their legs while I was all over the floor. It was very fun. Finally she joined in too. And the Spanish girl was fun to dance with, she asked me later if I had taken swing dancing classes. I thought she was joking. We got back to the hotel room around four or five in the morning. I had a cup of coffee and some chocolate from the vending machine down the hall and I uploaded the videos. AHFoW: You can read part one of Joakim's NY odyssey. Stick around for part three. If you want to write up your Luna experience for AHFoW please get in touch.